The Music Gallery's annual X-Avant festival opened with a bang last night (October 13). The first set featured the piano/flute/electronic duo of Heidi Wai-Yee Chan and Andy Yue, known as deenzi, setting the stage with rolling electric piano arpeggios. The interventions of spikes and grinds of noise framed the minimalism with space and thoughtfulness. Chan's bamboo flute (dongxiao) lent still another layer, but one more direct and dynamic in the wash of digital it floated in. The music was dynamic, flowed well and was endowed with cinematic flair. Local music maven Craig Dunsmuir presented his latest project, the Dun Dun Band for the second set. The group featured some of the most interesting musicians on the current Toronto art music scene, including Mike Smith (electronics), Blake Howard (percussion), Karen Ng and Colin Fisher (reeds), as well as Josh Cole (el. Bass) and Jay Anderson (electronic percussion, maracas). It was a set reminiscent both of prog and Afrobeat, with sequenced rhythms cued by Dunsmuir and executed by the rhythm instruments while the electronics and saxes played through, occasionally dipping into composed melodies. Fisher's occasional sax shredding was framed with the thoughtful insistence of Ng's alto work, while Dunsmuir and Cole underpinned the harmonic framework with a dual bass punch. It was remarkable in that it did not turn into the sea of mud that two basses have a tendency to do. Mike Smith is one of Toronto's most original electronic artists, and he and electro percussionist Jay Anderson completed the scenario admirably with Smith executing tweaked harmonic washes and Anderson forming the backbone of the sound with the inimitable Blake Howard, who himself lent a punch of acoustic percussion, echoing the woody sound of Chang's bamboo flute in the previous set. The evening closed with an iceberg of sound crashing through the Church hall that is the Music Gallery's home. 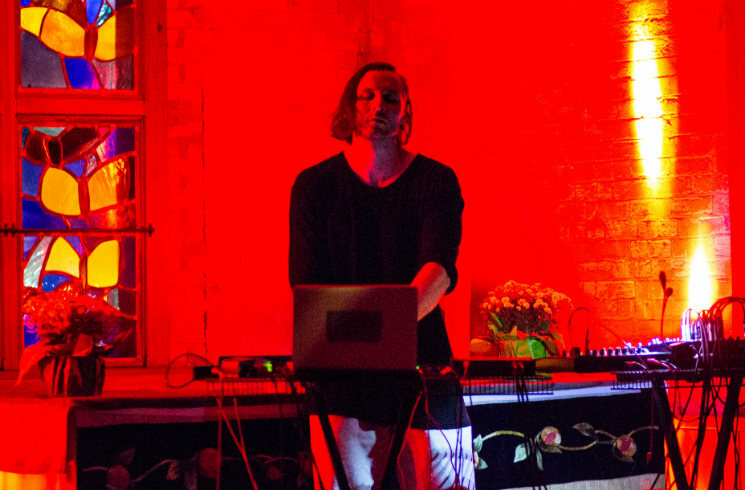 Egyptrixx's aural EBM-like sound couldn't have been more different than the previous sets of music. Sheets of metal sheared the air on top of a floor of subwoofer menace. It was loud, clear and majestic, constructing immense edifices of sound that alternated from glitch to industrially scarred beats to minimalist drone. While the sheer volume of the set may have constituted an actual physical assault, there was almost a detached coolness to the compositions that allowed a somewhat safe observation. The set also featured a light show involving strobes on the red and white spectrum that, as driven by the music, emphasized the brutalist architecture of the music, transforming the arched space of the church into something more menacing. If there were ever a question of whether dance beats could enter the world of extreme musique concrete, the answer would be effectively offered by Egyptrixx.